Tata Consultancy Services (TCS), which is already India’s most valued private company in terms of market capital, has just broke another record: It has become first Indian company to break Rs 5 lakh crore market capital. By doing so, it has also become world’s second most valued IT services company surging ahead of Accenture but still behind IBM. Due to increase in the prices of its stocks, total market capital of TCS swelled to Rs 5,03,148 crore or roughly $84 billion which is in fact more than the combined market capital of Infosys, Wipro, HCL and Tech Mahindra. Accenture has a market capital of $51 billion, and IBM has $194 billion. Previously, we had reported that TCS will soon become world’s 2nd largest tech employer with more than 3 lakh employees under their payroll and plans to add more than 50,000 employees this year. Last year, they had hired around 60,000 employees. Market capital is calculated by multiplying a company’s outstanding shares with the current price of the share; it’s a value which is used to determine the company’s size. 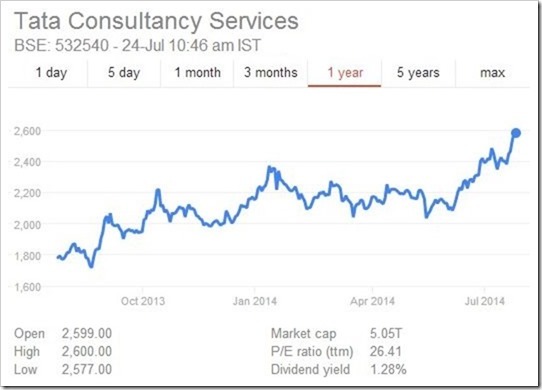 This huge surge in market value of TCS has eclipsed other major Indian IT services players. $84 billion market capital is something which makes TCS more valuable than combined market caps of Infosys (with m-cap of $31.7 billion), Wipro (m-cap of 23.3 billion), HCL (m-cap of $17.9 billion) and Tech Mahindra (m-cap of $8.5 billion). In fact, Rs 5 lakh crore market cap of TCS also makes it more valuable than all the other TATA companies combined which have a m-cap of $57.2 billion! If we observe ranking of Indian companies in terms of m-cap, then TCS is followed by ONGC ($57.63 billion), Reliance Industries ($55.53 billion) and ITC ($46.62 billion). Share market is jubilant on this record breaking news. TCS shares touched a record high of Rs 2,579.65, which is up nearly 2 percent since previous day. In the quarter ending in June, TCS reported a healthy increase of 5.5% in revenues to $3.69 billion, which has even beaten market expectations. As of now, TCS has 24 clients who are paying them more than $100 million / year, and 58 clients in the $50 million bracket. Maximum clients of TCS: 724 are in the bracket of $1 million, which actually shows that TCS is looking for stable and long term clients which mean steady income for the shareholders as well. Several investment experts have predicted that TCS shares will soon breach Rs 3000 mark as well.